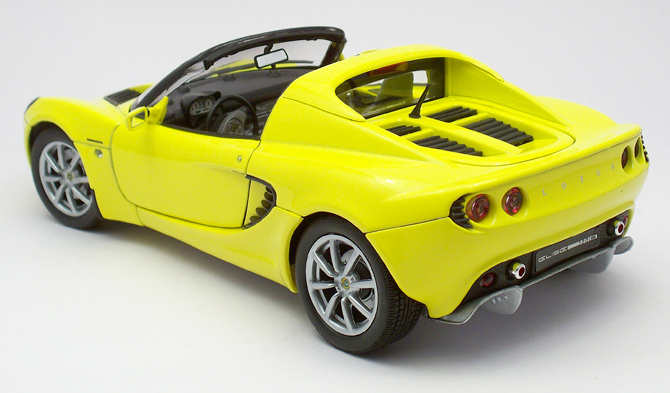 The Lotus Elise is a mid-engined roadster released in 1996 by Lotus Cars. The car named after Romano Artioli’s (chairman of Lotus at the time of the car’s launch) granddaughter. 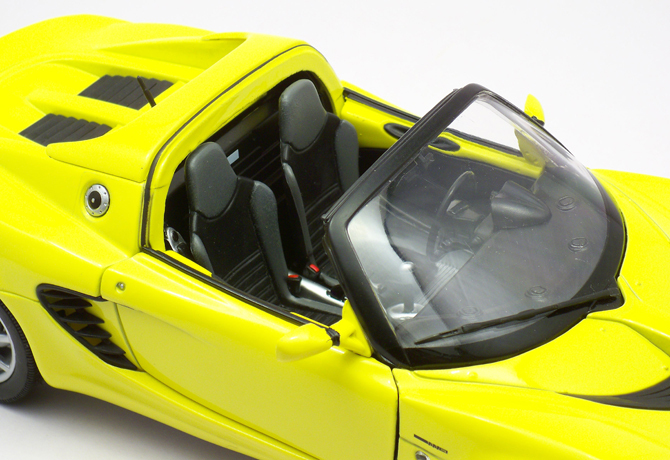 The car has a hand-finished fiberglass body shell, aluminum chassis that kept the weight and production cost low. 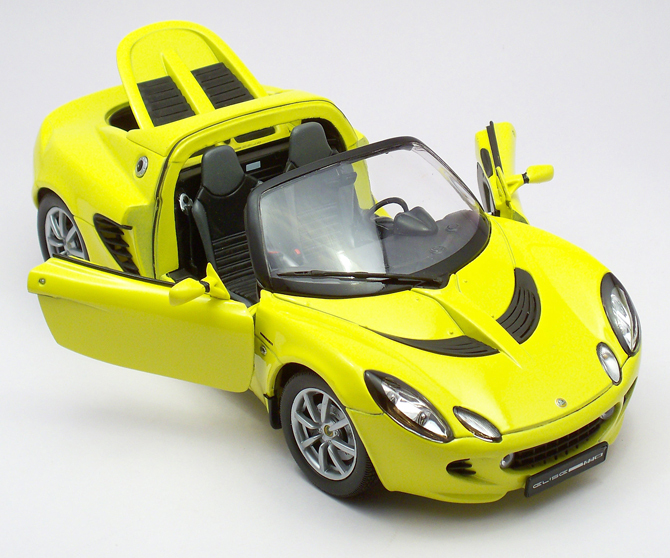 The 111S is a faster edition of Elise named after the Lotus type-number of the Elise M111 was introduced in early 1999 and what we have here is a 2003 model which come with a all aluminum 1.8 Rover K-series engine producing over 156bhp and capable of speeds up to 240 kmph. 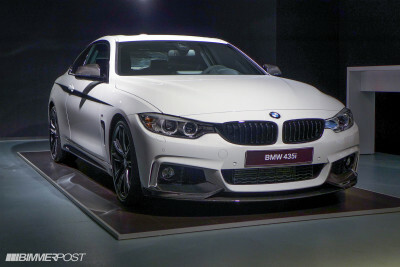 The updates includes more padding in the seats, headlamp covers, rear spoiler, cross drilled brake discs, alloy window winders and a 8 spoke road wheel design. 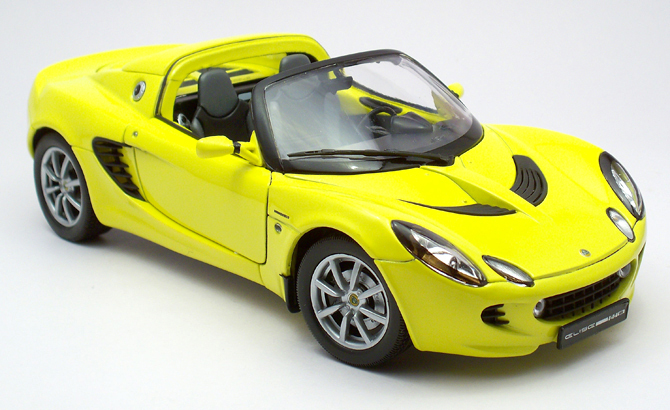 The Elise in an attention claiming yellow are replicated in 1:18 by Welly, as it grabs your eyes on first and has sufficient curves and grills to keep you glued on it for some time. 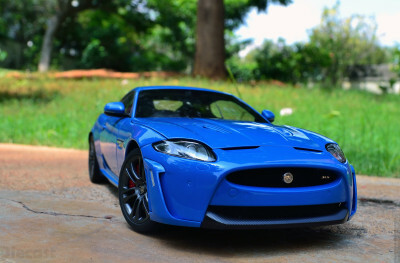 The tigerish front stance, black grills on the bonnet and the front bumper are all well achieved in this model. The body work is fantastic and cuts and curves are precise. The roadster’s body line looks excellent and looks like one piece, the gaps between the panels are very supple and you won’t be complaining about it any time. The rubber tires has some nice pattern, the 8 spoke alloy look very neat and even the cross drilled disc plates are detailed like in some high-end models but the caliper is not so interesting. 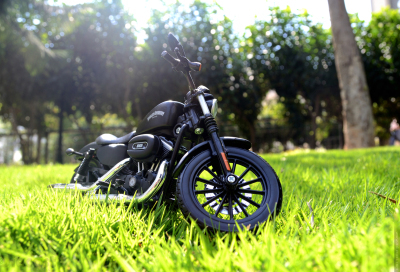 The rear end is curvy with a lot of details like the rear glass, tail lamps or the radio antenna. The engine cover grills are finished in black and they look very chunky and neat, the radio reception antenna is fat In comparison to the body but it’s cool have one. The grills covering the tail lamps add some more substance to the rear end. The twin barrel exhaust is not so great but the aluminum aerodynamic duct underneath it is classy. 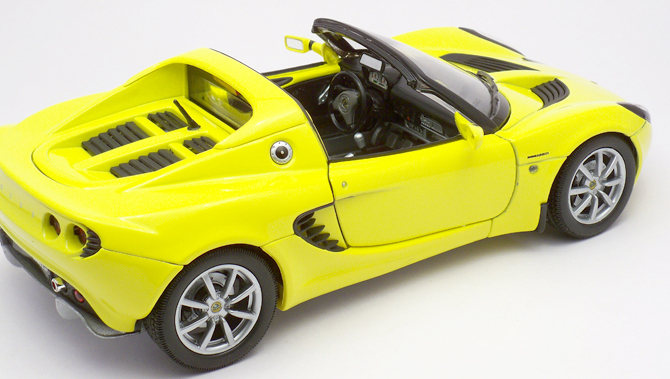 This roadster comes with no canvas top which exposes the interior well. The fuel cap is one of the best piece, which shows details of the original cap extremely well. 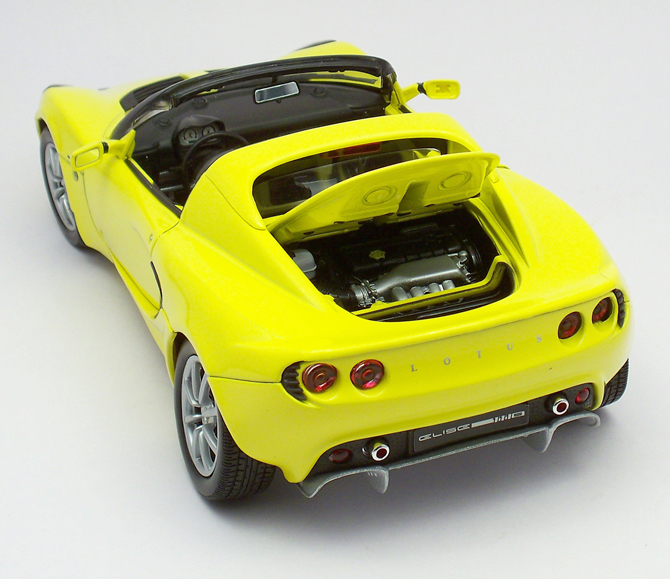 The air intake ducts on either sides adds aggression, being a targa the rear roof line is fixed but as in all Elise this serves style and substance in a perfect blend. The seats aren’t the best in class! They look plasticky and even the couture is not so great, the relief though is the dual color usage for the upholstery. The Seat belts are humongous and don’t match the seat’s dimension. The interior is nice but few bit and pieces are huge like the gear shifter, hand brake lever, window winder and even the foot paddles which look bigger in comparison to the steering wheel and the dials. The steering wheel is fantastic and dials with white facial complements it. Unfortunately I got this model with missing right rear view glass, which would have fallen in transit. This pretty model has opening doors and hood to reveal the engine. 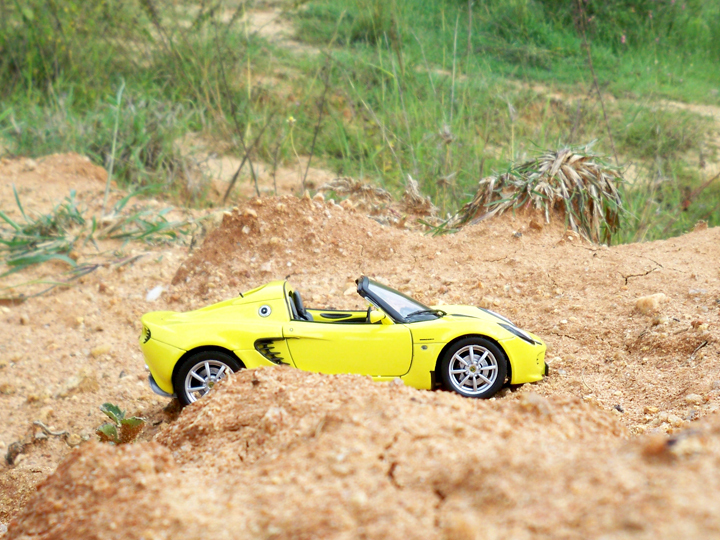 The steering system steers the wheels and fully functional suspension completes the picture. 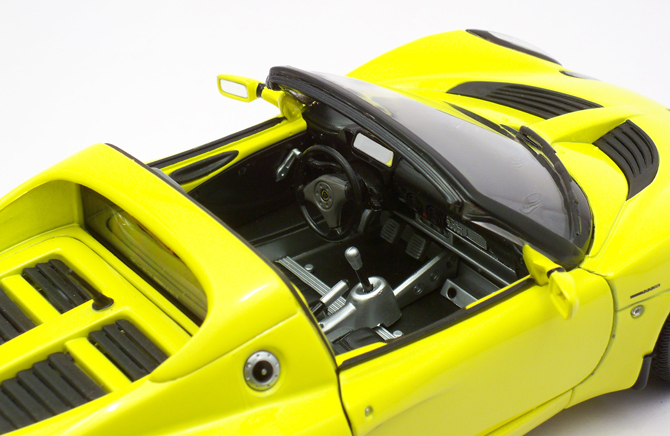 As you open the rear hood, you will be greeted by this small yet nicely detailed engine tucked inside the micro bay. The engine casing in mild chrome makes this engine more realistic! Overall this is one nice model to endow my display case without causing any huge damage to my bank balance.